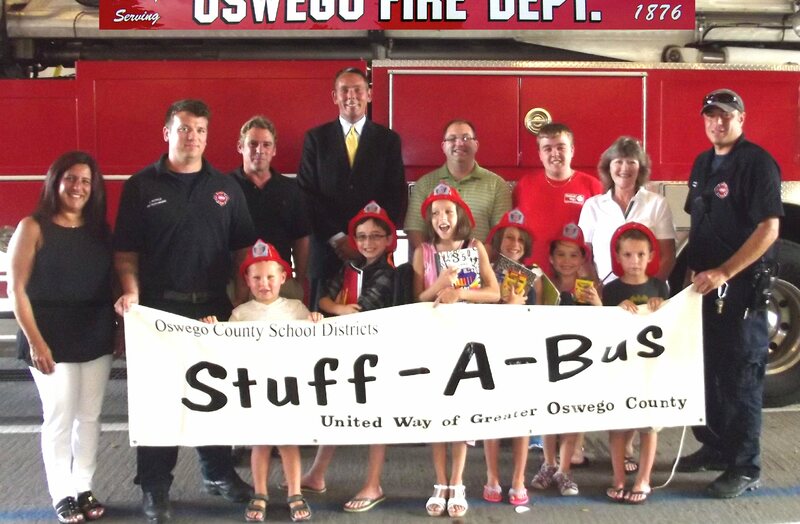 OSWEGO, NY – Patrick Dewine, executive director of United Way of Greater Oswego County has announced that the Oswego Firefighters’ Association Local 126 is currently collecting school supplies through Aug. 23 in support of the Stuff-A-Bus campaign at its main headquarters, 35 East Cayuga St. in Oswego. Oswego Firefighters Association Local 126 is collecting donations of school supplies at its headquarters, 35 E. Cayuga St. in support of the United Way’s Stuff-A-Bus campaign. In front, from left are: Nolan Verburg, Ben Norton, Kate Donoghue, Kira Donoghue, Leah Norton and Kam Falcetti. Standing from left are: Stuff-A-Bus committee member Jennifer Losurdo of the Oswego City-County Youth Bureau, Firefighter Jordan Patrick, Fifth Ward Councilor John Gosek, United Way of Greater Oswego County Executive Director Patrick Dewine, Third Ward Councilor Nate Emmons, Stuff-A-Bus committee members John Michael Kelly and Laurie Kelly, and Firefighter Matt Alton. Made possible through a collaboration between United Way and Oswego County school districts, the United Way’s annual Stuff-A-Bus campaign collects school supplies for children in need throughout Oswego County. In addition to the Oswego City Fire Department school supplies are also being collected at the Oswego City-County Youth Bureau, 70 Bunner St. in Oswego and at City Hall, 13 W. Oneida St., Oswego. “Stuff-A-Bus committee member Jennifer Losurdo did a great job in reaching out to these entities. With the effort our committee members have put forth we are looking forward to filling all our buses during our community Stuff-A-Bus collection day,” Dewine said. The Stuff-A-Bus community collection day will take place August 24 when the United Way looks to fill eight school buses with school supplies from pens and pencils to notebooks and backpacks. Businesses throughout Oswego County that have been collecting school supplies over the past few weeks will have a school bus on site where volunteers will be accepting donations. School supplies collected through the Stuff-A-Bus campaign will be distributed to students in their respective school districts, while supply lasts, according to the following schedule. A copy of your child’s 2015-2016 school report card will be required for entrance to pick up school supplies. Made possible through a partnership with United Way, school districts throughout Oswego County, and several local business and organizations, the Stuff-A-Bus Campaign collects donations of school supplies for distribution to less fortunate students throughout Oswego County.